CATHERINE DAVIES was born at the Bent Orchard, Woolhope, in the county of Hereford, March 7th, 1812. For several years she suffered poor health, and doubts were at one time entertained of her life; indeed, her health was so precarious that she was looked upon as the invalid of the family. The dream referred to, no doubt, influenced Mrs. Davies’ mind greatly. At the same time it was the written and living Word that led her to Christ the Lamb of God that taketh away the sin of the world. Previous to this she had been a constant attendant on the services of the Established Church, but now having found Christ and being born again of the Holy Spirit of God, she decided to cast in her lot with the Primitive Methodists, who held preaching services at Winsall’s Mill, the late Rev. C.T. Harris having the honour to give her first class-ticket, and which she often recounted in her reminiscences of the past. Some time after becoming a member of the Primitive Methodist Connexion, she became acquainted with the late Mr. Thomas Davies, to whom she was married in the year 1848, and came to reside in Hereford, where she remained to the day of her death. As a member of this Church, she was consistent, devoted and self-sacrificing. In the best sense of the term, Mrs. Davies was a staunch and true Puritan. She was a believer in, as well as a diligent attendant on, the services of the sanctuary — always being in her place when the time of service came round. Nor did she allow little things to keep her away from the house of God. She also met in class and found time to frequent the week-night prayer meetings, finding them helpful to her spiritual life as well as having a desire and appetite for them. She was also kind to the poor and those less favoured than herself in worldly goods. But what she did in this respect she did quietly and unostentatiously, the receiver never knowing the giver of the gifts which he or she received. She was a good wife and a kind mistress – as her faithful servant for over thirty-one years can testify. There are few cases where servant and mistress get on so well together and where the attachment and affection continue so long for each other as in this case. Some six years or more ago, she was called upon to part with her beloved and devoted husband. His death was occasioned by a fall; but she bore up well, regarding it as among the all things that work together for good to them that love God, to them that are called according to His purpose. For the last few years she was unable to attend the services of the sanctuary owing to weakness and nervous depression. But she was none the less interested in them on that account, always sending her collection money and class money, not only for herself, but for her deceased and departed husband as well. Indeed, her liberality to God’s cause was a special and particular feature in her religion. She was not like some people, who talk about their affection for God’s house, but never show it. Mrs. Davies believed in giving as she did in receiving. The interests of Zion lay near her heart and she rejoiced in its prosperity. I often visited her during her retirement to the privacy of her own home, and she was not only glad to see me, but willing to receive any spiritual counsel or help I could give her. There was nothing morose or yet doubtful about her religious experience, but a confidence and hopefulness which it was both refreshing and cheering to listen to. She knew, like Paul, Whom she had believed and was persuaded that He would keep that which she had committed to His care. Indeed, her one unvaried testimony was that she was on the rock Christ Jesus. There was no fear, no doubt, but a beautiful implicit confidence in Christ as the Saviour of sinners. Yes, Christ to her was everything and she longed to be with Him. The Thursday before she died I saw her for the last time and spoke to her, and then she said she was on the rock and wanted to go. The following; Tuesday morning, January 30th, 1900, without a struggle or a groan, she entered peacefully into her eternal rest. Taken as a whole, her life was noble, beautiful, consistent and faithful, a life which has left a fragrance behind it, and one which we shall all do well to follow. Like all mortals, she had her faults and failings, and she was conscious of them; but, despite these, she was a good woman, and we only wish that the Church had many more like her. Under my feet at last. Records identify that Catherine’s mother was named Ann. 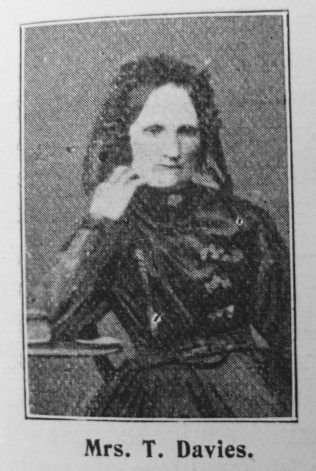 Catherine married Thomas Davies (abt1814-1893), a builder, in the spring of 1847, not 1848 as identified in the obituary, in the Hereford Registration District.